2417 11 Hungaria / SZEGEDIN - interesting and rich collection mounted on pages with rarely issues, the partly only in small edition appeared are. With also Michel no. 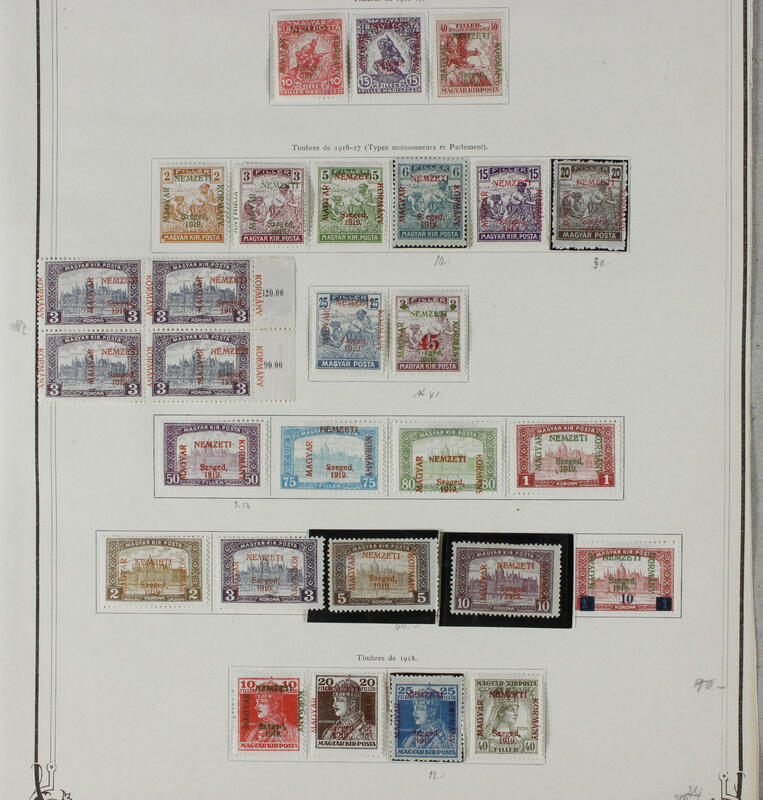 11 (edition 400 piece), 19 (edition 400 piece), 20 (edition 400 piece) and further scarce values, printing flaw and so on. An interesting and extraordinary area, by Michel clearly undervalued! 2418 17 Hungaria / BANAT - interesting collection the entente issues for the occupied Banat 1919 with hardly once offered issues, the partly in small edition appeared are, with also Michel no. 17 (issued only 300 piece! ). 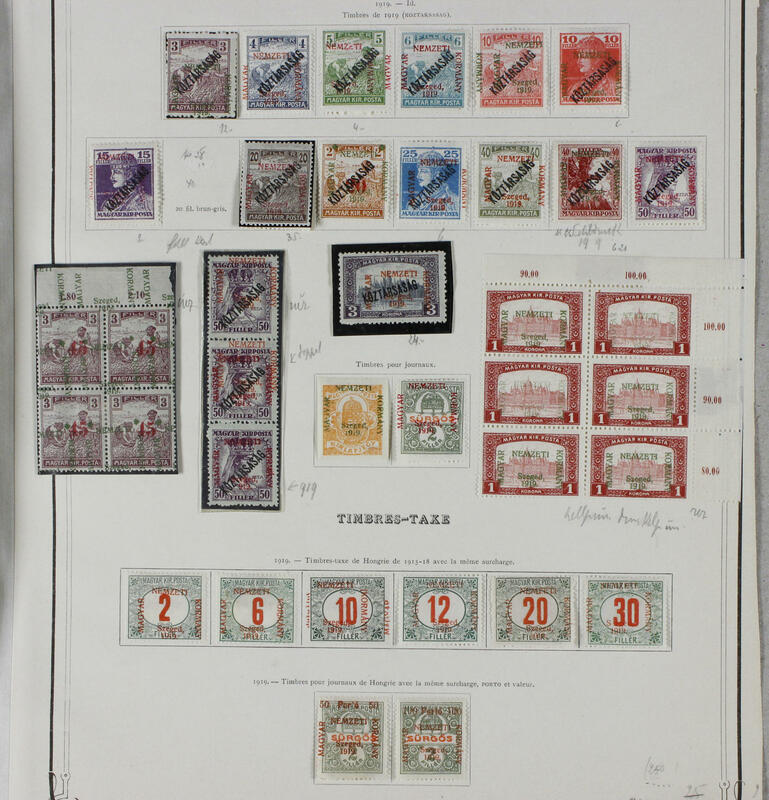 In total includes the collection 56 values. A rare offered and undervalued area! 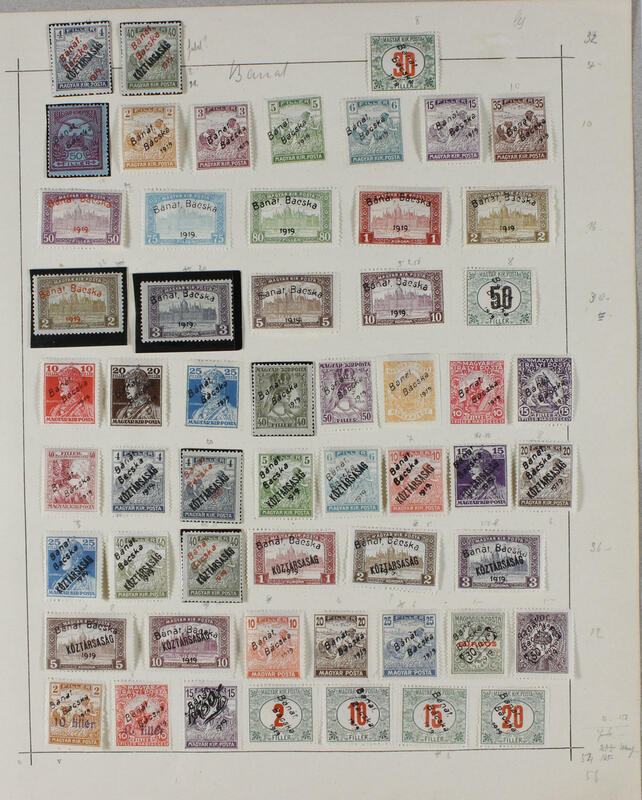 487 Iceland - 1944 / 2008, wonderful mint never hinged collection, complete with all issued stamps in two albums formed. With also the good issues from the fifties, novelties, as well additional still numerous stamp booklet. A wonderful quality object! 581 ⊙ Iceland - interesting collection in a large stockbook, almost exclusively used, with numerous older issues, special- and commemorative values and so on. Very high catalog value! 713 ⊙ Iceland / stamp booklet - 1992 / 2004, nice and rich collection from different stamp booklet in the ring binder. As well popular issues, lovely motives and so on. High acquisition price! 853 ⊙ Iceland / stamp booklet - very nice and rich collection from stamp booklet in the ring binder with numerous sought-after issues, lovely subjects and so on. From the years 1991 / 2003. Large number of pieces and very high purchase price! 1000 Iceland - 1987 / 2010, the officials annual collections complete, all very fine illustrates with the mint never hinged issues the respective volumes. Decorative collection with very high subscription price and in total 24 different year sets! 1001 Iceland - 1960 / 2010, very nice and cultivated mint never hinged collection on lighthouse hingeless preprinted pages in two spring back binders accommodated, except for very few issues complete, like in the subscription related. With also numerous stamp booklet. A very nice quality object! 1002 ⊙ Iceland - 1965 / 2010, very nice used collection, except for very few values complete on lighthouse hingeless preprinted pages in two spring back binders accommodated. With also many lovely motives, a large number stamp booklet and so on, all mainly on subscription. Very nice quality object! 1003 FDC Iceland - 1960 / 2010, very rich collection from illustrated First Day Cover, in total approximate 500 pieces with numerous special- and commemorative issues, beautiful subjects and so on. Very high purchase price! 2220 Iceland - 1944 / 99, lovely mint never hinged collection, complete with all issued stamps in the Lindner T hingeless printed form ring binder including all issues from the forties and fifties. A very nice quality object! 2245 ⊙ 141, 125/40, 142/46 Iceland - 1873 / 1994, very nice and extensive used collection with plenty of better issues in the KABE illustrated album. As well early values, better postal stamps, Gildi overprints, postage stamps set 1902 King Christian with corresponding official stamps issues, the good overprint 10 Kr. On 5 Kr. From 1930 neat cancelled (Michel no. 141), state parliament set 1930 (Michel no. 125 / 40), Allthing 1930 (Michel no. 142 / 46) and numerous further better issues, a nice part thirties and forties and so on. Magnificent object with very high catalogue value! 2413D x India - extensive lot packed in a carton. As well issues on stock cards, as well in the stockbook, covers and so on. Treasure trove!